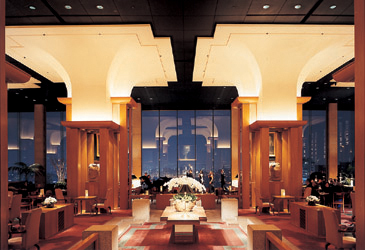 Oct. 6, 2005 — As the heat of summer cools and the leaves start to fade, Grand Hyatt Seoul's lobby lounge pays salute to the musical theatre with a tribute to Broadway, every Thursday evening between Oct. 13 and 27, 2005. This musical evening entitled a "Grand" Broadway Evening, features an array of musical signatures from the great white way, as the lobby lounge of Grand Hyatt Seoul turns itself into a musical theatre. Adding to the excitement, the lobby's 10 meter high glass walls provide spectacular night views of the river and the city, setting a brilliant stage for the evening's entertainment. The experience of Broadway's most famous musical numbers, complete with costumed performances, coupled with the lobby's majestic night views and a selection of canapés and a glass of the Moet & Chandon Brut Imperial Rose, guarantees an evening to remember. The "Grand" Broadways Evening starts at 9:15 p.m. with a medley of familiar and enjoyable tunes. The admission fee is 35,000 won (about 34 US dollars) exclusive of tax and service charge which includes a complimentary glass of Moet & Chandon Brut Imperial Rose. Advance reservations are required. For information and reservations, call 799-8165.